The narrative is oh so easy to construct. The day Aaron Judge was activated off the disabled list, the Yankees went out and clobbered the Blue Jays. In his first two games back in the starting lineup, they mounted a come-from-behind win over the Red Sox and then blew them out the next night. Aaron Judge is back, and the boys are fired up. The impact of Judge’s return on the field is obvious. He’s still shaking off the rust at the plate — Judge is 1-for-8 with a little flare single in his two games back as a hitter — but the potential for serious damage is there every time he steps in the box. Judge is an imposing figure at the plate. He’s also a quality right fielder and he’s bumped Brett Gardner to the bench, which is the best thing for the Yankees right now. Off the field, measuring Judge’s impact is impossible, but that doesn’t mean that impact doesn’t exist. 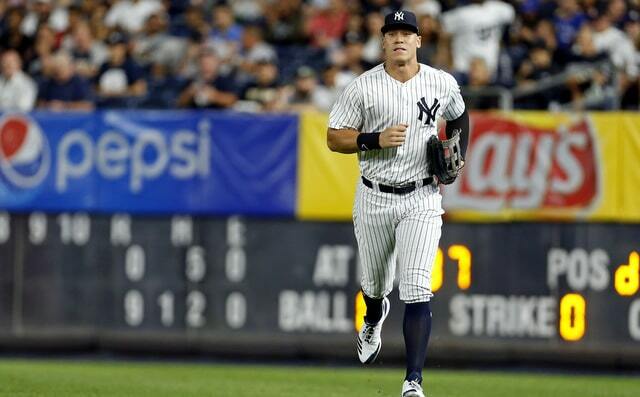 Judge was with the Yankees the entire time while rehabbing the wrist. He didn’t go to Tampa for a few weeks or anything like that. Judge remained with the Yankees, went on the road trips, and was in the dugout for every single game while on the disabled list. He was with the team, but he didn’t feel like he was with the team. Even though he’s less than two full seasons into his big league career, Judge has clearly emerged as a leader for the Yankees. He’s great on the field, he’s ultra-accountable, and he has a squeaky clean image off the field. A controversy-free superstar and a key figure in the clubhouse. “I hate to put it on a second year player, but he is definitely one of the leaders here,” said Dellin Betances to Joel Sherman. Is it a coincidence the Yankees beat up on the Blue Jays and Red Sox after Judge returned? Yeah, probably. Marco Estrada had been struggling for a while before going into last week’s start, and the Yankees didn’t do a whole lot before Neil Walker’s home run the other night. Last night could easily be chalked up to David Price doing what he normal does in Yankee Stadium. Those frustrating losses Saturday and Sunday still happened, after all. That doesn’t mean Judge isn’t having an impact on the team with his mere presence, however. This is still baseball. You’re going to lose games and teams often look bad — sometimes very bad — when they lose. Judge is a baseball player. He’s not a miracle worker. His presence and return to the lineup can give the team confidence and an on-field boost, though that’s only part of the winning equation. He can only lead. Others have to follow. It is far too early to discuss Judge as a potential captain — Derek Jeter was named captain in 2003 (! ), his eighth MLB season and after four World Series rings — but he has captain qualities, I think. At least based on what I can tell as an outsider. He’s a go-to guy in the clubhouse, he seems to connect with literally everyone on the roster, and any message he tries to send gets backed up by his play. It can be easy to overstate a player’s intangibles and their impact, but it’s a real thing, and Judge has it.